The toughest test you will ever face as a Christian is when you are taken advantage of, overlooked, or falsely accused. Proverbs 18:19 says, “A brother offended is harder to be won than a strong city” (mev). In other words, it’s easier to get inside a city that’s barricaded with armored guards than to reach someone who has been offended. Let’s look throughout the Bible to see how holding on to offense wrecked the call of God on so many people. These individuals had great potential to change their surroundings, but instead they caused great destruction, all because of offense. Second Samuel 13 tells the story of Absalom’s downfall into the trap of offense. His half-brother Amnon raped Absalom’s sister Tamar, and their father, David, did nothing! Deep offense comes when we feel unprotected by our parents or the people who are supposed to shelter us. From the day Amnon raped Tamar, Absalom never moved on. He was stuck in the land of offense. He had the potential to be a great influencer, but he ended up causing great division and chaos in his father’s kingdom. Second Samuel 16 tells us the story of Ahithophel, who was David’s closest advisor. The Bible says he spoke as the oracle of God. Some commentators believe that Ahithophel was the grandfather of Uriah, Bathsheba’s husband. David slept with Bathsheba when Uriah was off to war, and Bathsheba became pregnant. To cover his tracks, David had Uriah killed. Deep offense comes when our king, our pastor, our leader doesn’t practice what he preaches. After Uriah was killed, Ahithophel hooked up with Absalom, who rebelled against his father. Isn’t it amazing how offended people usually join forces? Ahithophel, who was once the oracle of God, became the mouthpiece of Satan. Deep offense comes when we feel disrespected. 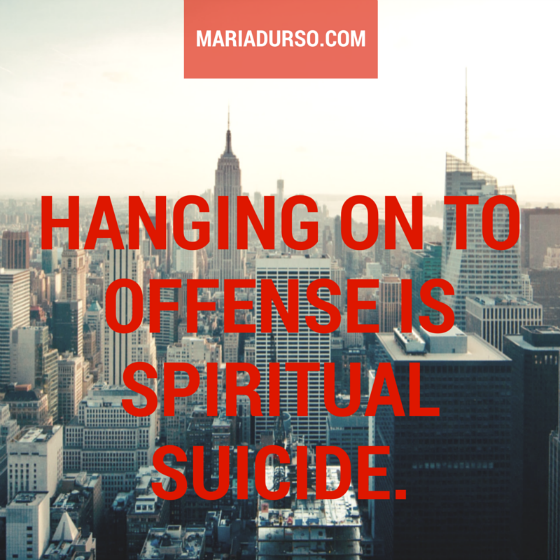 Hanging on to offense is spiritual suicide. How many times have we been offended by the actions of someone on our ministry team? Maybe we were overlooked or bypassed. Maybe someone else got the solo. Maybe another brother was asked to be on the executive team. Maybe all your hard work wasn’t mentioned in the bulletin, but Sister So-and-So received a huge acknowledgment and all she did was make a Bundt cake. What’s so hard about making a cake with a hole in the middle? Be careful not to allow pride and the need for recognition to trap you in a cage of offense. Take my word for it: when we do things for recognition, because the Holy Spirit loves us so much He makes sure we don’t get any! Hanging on to offense prevents God’s Spirit from working in us, and it hinders His Spirit from moving in our midst! Question: Are you hanging on to any offenses? Confess whatever or whomever you are holding on to the Lord, repent, and be free from your heavy heart! « Do you need a brain wash?